That makes our souls to soar ! If the messenger be an ant, heed him! Choose to BE MORE Now! ” . . . For you to gain your Ascension there are certain requirements of the Law necessary for you to fulfill: balance more than half, fifty-one percent, of your own karma; grasp the understanding of each of the Seven Rays; put on the garment of the Christ; and, most assuredly, integrate into the fulfillment of your Divine Plan that Mission which your God Presence vowed you would accomplish.You together — you and your Presence as One Being — vowed before the Altar of the Almighty that you would perform the perfect work at the right time and in the place provided, for you too have within your consciousness the ability to attain to that which you are required by the Law to accomplish.“There is likewise the necessity to reach higher. 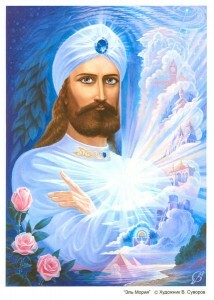 For you to accelerate to a higher state of awareness, the Messengers must hold high for you that attunement, that certain vibration of the Ascended Master Consciousness. This will set in motion a magnet of Ascended Master Fire so that you might continue to reach high, to reach for the Star of your own God Presence.The desire of the Brotherhood is to convey the understanding of what it means to stand in the Earth and yet know that absolute Perfection at inner levels is alive, is functioning to the highest degree of the Mind of God, sending forth Rays of God Consciousness to affect the world.The Core of your being must hold the elemental essence tethered for you to keep your physical body for the completion of your mission in this life. 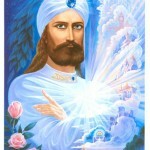 All these things are lavished upon you, Beloved, because there is Cosmic Law, because there is this immovable Foundation where you are upheld by the working of the Mind of God, the Heart of God, the Light and Love of God.“As your attention to these highest planes of consciousness is held there by the Messengers, you are able to continue to soar, to soar to heights without limitation.This, Beloved, will take you beyond where you have ever thought or imagined possible once you have touched the Heart Flame of the Mighty I AM, once you have allowed for the Light of the God Presence to be in command of your lifestream, once you have proven that you can be tested with greater initiations, once your own God Presence can trust that having given its Light, that Light will be used wisely and will not be squandered, will not be misused, nor will there be any harm to other parts of life. Then you, Beloved, will be entrusted with greater increments of Light. “What remains in the Ascended State are the positive momentum that you have already garnered while in the physical body. 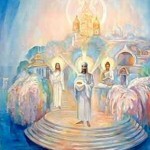 The momentums that you garner now and have garnered throughout your many incarnations will determine, upon your Ascension, the virtues and capabilities stored within your Causal Body ready to be activated, ready to be put into the fullness of the use that is determined by your God Presence or the collective Wisdom of the Ascended Masters. “This is why some have far greater responsibility immediately upon ascending than do others. For, lifetime after lifetime, these stalwart ones have accumulated momentums of God-Good, momentums of stored, perfected Light and God Consciousness, enabling their own God Presence to accelerate them into greater opportunity. . .
Master MORE’s book is available for free download here.